I think Colombia did a poor job today, and I think the Venezuelan opposition should come out and blast them for it. The opposition needs to side with the people, those who live on the border, those who benefit from trade, and those who suffer at the hands of the FARC. Colombia’s escalation today, predictably followed by an intemperate rupture of diplomatic relations, does nothing to advance the cause of Venezuelans in any of those fronts. It hurts Venezuelans on the border, compromising their security. It hurts our economy, compromising trade. Worst of all, it entrenches chavismo’s tacit alliance with FARC, strengthening rather than weakening its position. Colombia’s actions seem to be guided by an internal squabble between Uribe and Santos. It is no coincidence that Santos has gone out of his way to not offer Uribe any kind of support, meekly saying that Uribe is President until he isn’t. That’s not support, that’s between-the-lines condemnation. Uribe, in the meantime, has come out and said that he won’t mobilize troops to the border, the same border with an aggressively hostile government that is harboring terrorists and poses a threat to your security, the same government you are denouncing and giving ultimatums to. In other words, Uribe is purposefully escalating, and then decides not to. Is there a more perfect definition of a bluff? This on the heels of a performance by the Colombian Ambassador that has received mixed reviews from even the most avid Kool-Aid drinkers. We all know Venezuela harbors the FARC. That is not the point. The point is how do we get Venezuela to cooperate. Colombia’s actions have been reckless. They do nothing to help drive the guerrilla from the border, so they do nothing to advance Colombia’s security. More to the point, escalation hurts Venezuelans, it hurts Venezuela’s opposition in particular, forcing them to take a stand and changing the subject. Shoot me, but the opposition should come out and condemn Uribe. Update: As expected, the Mesa de Unidad came up with a boring, bolier-plate communiqué. 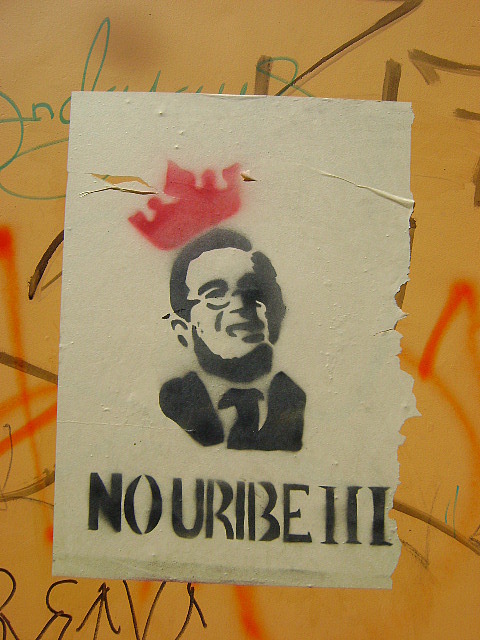 It’s all Chávez´s fault, Uribe can do no wrong, the FARC are in Venezuela. Dog bites man, nothing to read here.